Are you seeking a zen state of mind? A peaceful, relaxed togetherness of body and mind. Try riding your bicycle to the beach. 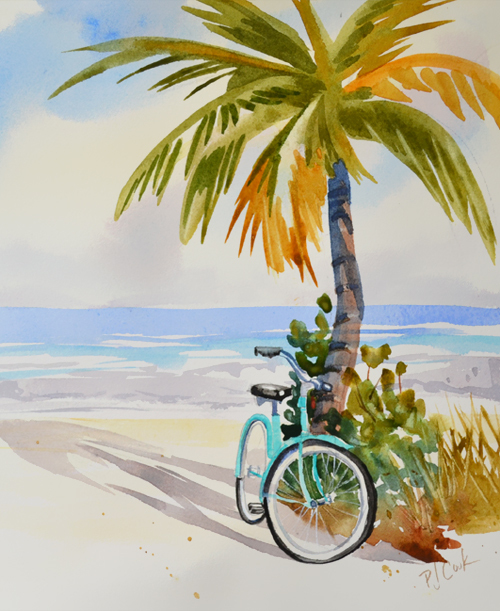 Beach Zen is a new original painting featuring a beach, palm tree and a bicycle. Is it the horizon, the beautiful color, or the sound of the waves? Beach Zen can take you there. This original watercolor will fit into a ready-made mat and frame. Would make a great gift. Free shipping on unframed watercolor. If you are interested in purchasing in a mat and frame use contact page for more information. “Beach Zen” 10 x 8 inch watercolor, ©2015 PJ Cook. Ocean Beach Path Auction Ending Soon!